Choosing Dogs Toys: Ever Thought About Making Your Own? These are some of our favorite engaging dog toys! Have you have ever given your pooch a new expensive toy and then encountered its scattered remains only moments later or have wondered why your pooch loves one toy and then ignores another? Unfortunately, there’s really no such thing as an indestructible dog toy. An interesting study in the Journal of Animal Cognition looked at why dogs are so picky. They uncovered that dogs look at toys the way wolves look at prey and that dogs get use to the smells, textures, and sounds of toys. Which is why over time your dog becomes bored with that toy. Keeping this in mind, is it necessary to have different toys especially when you may be on a budget? Or are dog toys optional or actually required? Keeping this in mind, let’s find out! Dog toys that stimulate your dog mentally are best. Just like humans, dogs need different kinds of “entertainment” as well. Canine behavior experts say that toys are necessary. Toys alleviate boredom, offer comfort, promote fitness, and – most importantly – guard against the development of troublesome habits. Experts have identified certain toy matchups that seem to work better to fulfill known canine instincts. 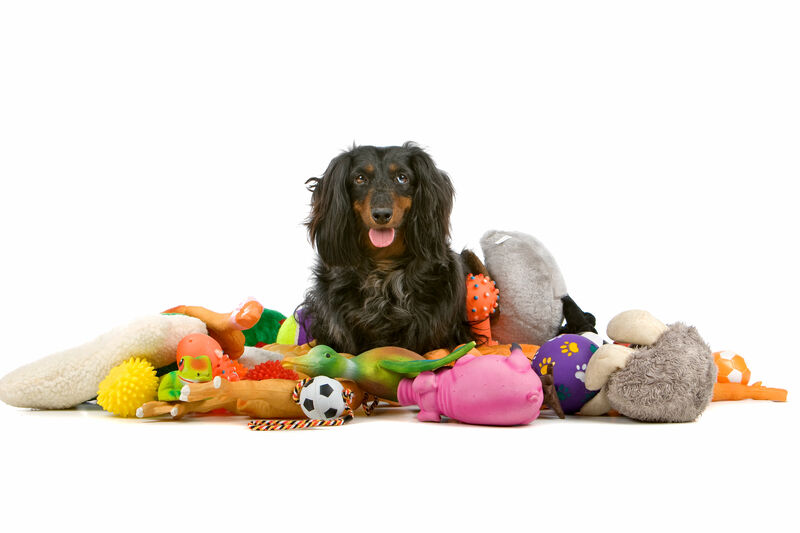 Dog toys can help your pet in many different ways! The categories of toy matchups include first interactive toys which involve you and your dog (e.g., toys you can throw, or play tug-of-war). Second, distractive toys which only include your dog (e.g., chew toys, puzzle toys, hidden treat toys), and comforting toys that can involve you and your dog during play or solely your dog enjoying the toy (e.g., soft/stuffed toys, toys or objects that smell like you). My friend’s little man Dino is a two-year-old Shih-poo. He is less than 10lbs but is fast and tries to create havoc as if he actually thinks he is a giant dinosaur. 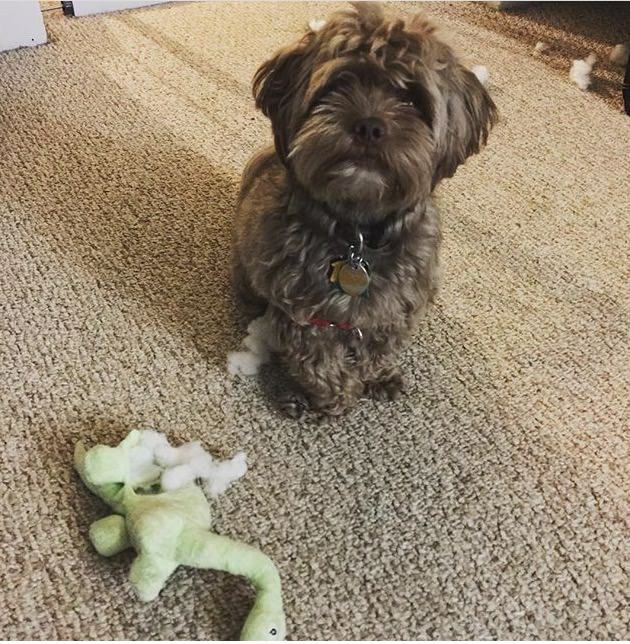 His favorite toy (and my savior) is a stuffed dinosaur–he will do anything to play with this toy–and it has been through it all! When she tried to throw it out after it was beaten, bruised, squeaker squashed, and insides were no more— he sat by the garbage and cried. Needless to say.. she is now on surgery 15. If you have ever had an experience like this, there is something about that one toy that tops the others. Your dog may enjoy one type of matchup over the other– but your dog also may have that one, favorite toy. Keep in mind that each dog may have their own preference. This is why it can be difficult predicting which toys your dog will favor. If you are trying to keep the novelty effect or spark the additional curiosity of other toys, it will be useful if you use one from each of the three major toy types (interactive, distractive, comforting) every week. If your dog has a particular comforting favorite, you may want to allow that toy to stay in the mix from week to week. How to respect your budget and still have fun! As the official dog parent (aka “responsible party”) in your interspecies household, you are already forking over the green for vet care, food, and bedding as well as probably a variety of other fun ideas for your little pooch. The good news is, you don’t have to spend a lot to provide a variety of toys for your dog. Make Your Own Dog Toys. There are plenty of ways to make toys from items around the house such as a t-shirt wrapped around a bottle for dogs that like the crinkly noise or a tennis ball and a t-shirt toss toy. For safety’s sake, strive for all natural, organic, plant-based fabrics and fibers, which will ease worries about lead-based paints and dyes and PVC/phthalates in plastics and rubber materials. Also, do your best to avoid easily shreddable or detachable extras such as goggle-eyes, rhinestones or “bling,” loose strings and easy-access stuffing or squeakers. With a little creativity, you can enrich your dog’s life while respecting your budget! Recipes for making your own dog puzzles. Puzzle toys for dogs are particularly easy to make at home and may not cost you anything at all. Here are five treat based and non-treat based “recipes” to try. The Plastic Crunch (treat-based): One of the reigning favorite dog toys for many breeds is the humble plastic bottle. What you need: A jaw size-appropriate plastic bottle or jug; scissors; kibble or small treats. What to do: Cut some holes in the sides of the bottle. Make sure the holes are bigger than the treats inside. Present to your dog and let the crunching and treat retrieval begin! Seek You (non-treat-based): Hide-n-seek is a great game for both human and canine participants – especially when the “hider” is you! What you need: You, your dog, one other person, a set of commands your dog recognizes. What to do: You hide while the other person plays with your dog. When you are hidden, the other person gives your dog a command to seek you. 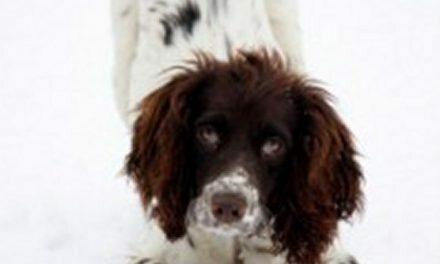 Wild Forager (treat-based): If your dog has strong “hunting” or “working” instincts (collies are a great example), you are in luck, because you can create your fabulous puzzle with just a bowl of kibble or treats and a good throwing arm. What you need: Your dog’s food dish, kibble or treats. What to do: Head outside and pretend the dish is a baseball glove and the contents are a baseball. 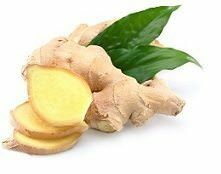 Fling the contents out into the grass and turn your dog loose to go foraging. Muffins Away! 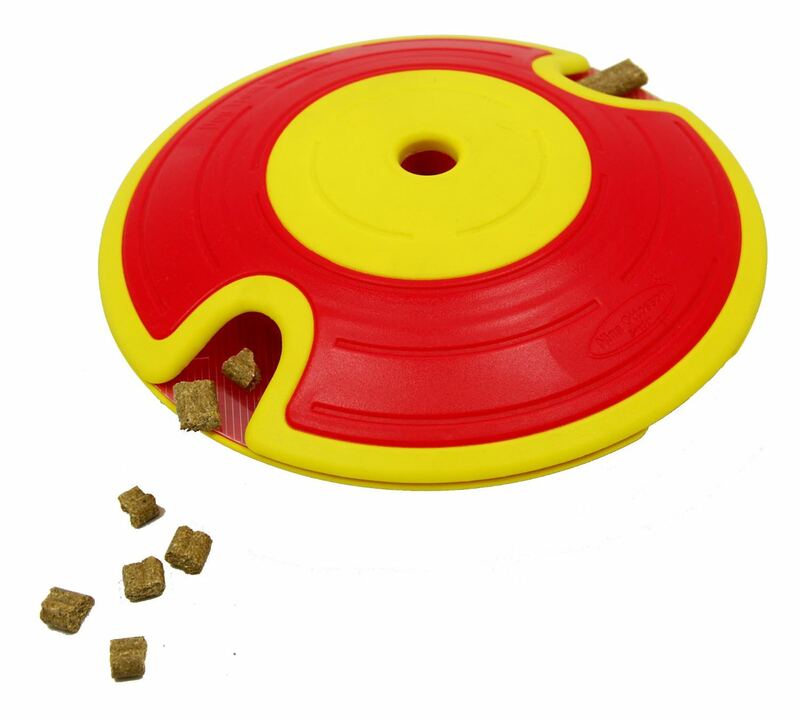 (treat-based): If you can describe your dog’s eating habits as “now you see it; now you don’t” this is a great puzzle toy that can make your pooch work for his supper! What you need: A muffin tin (regular or mini); kibble or small treats. If you don’t have a muffin tin, an empty egg crate will work too. What to do: Turn the tin over, so the muffin/egg wells face upwards. Sprinkle the food or treats in amongst the wells. Here, you may want to put down a rug or mat to protect tile or hardwood as your dog noses the tin around to get the goodies. Fetch or Catch (non-treat-based): This puzzle presents the same toys in new ways to prolong the length of time your dog favors a toy. What you need: A favored or less favored toy and a toy such as a rope or stick, a favorite “go fetch!” toy, or tug-of-war toy. What to do: If your dog likes to fetch, you can tie the favored toy to the fetch toy, throw it, and await its return. If your dog prefers to chase only, tying the toy to the end of a rope and dragging it around behind you will encourage your dog to run after it and attempt to pounce. Not Crafty? No Time? 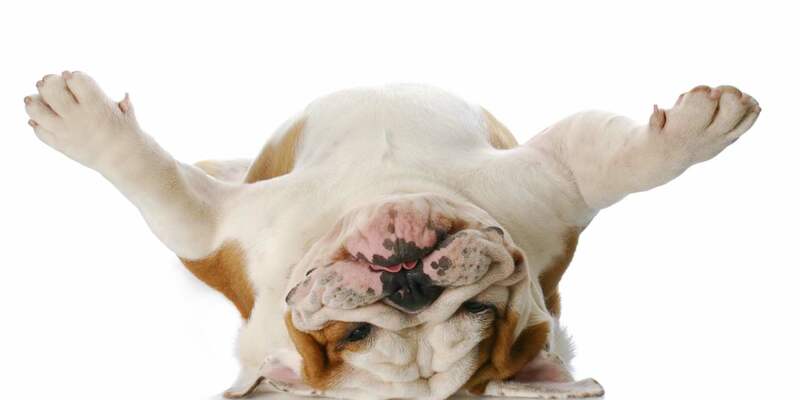 No Worries – Check These Dog Toys Out! Nina Ottosson. This Swedish entrepreneur has become globally known for her innovative, interactive dog puzzles. Puzzles come in easy, medium and advanced levels. All materials are eco-friendly and non-toxic. Busy Buddy. 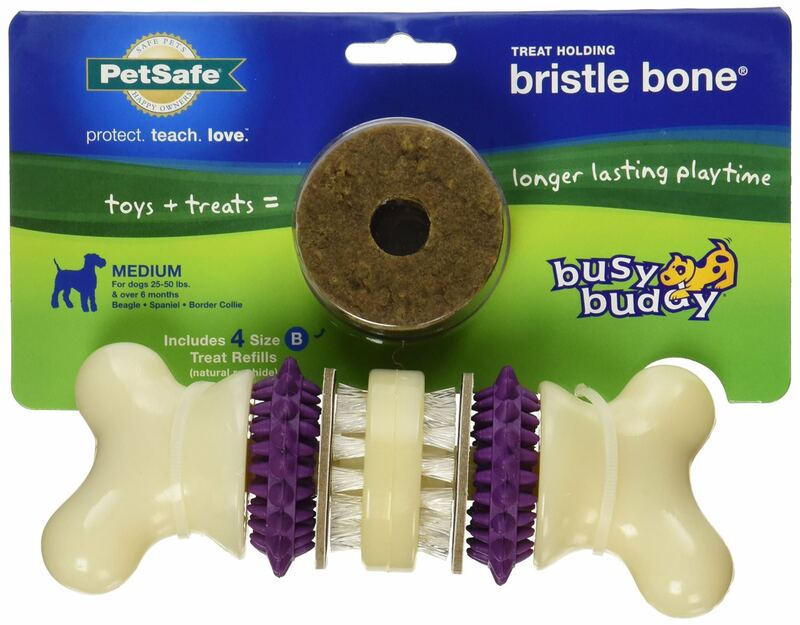 Part of the PetSafe product line, Busy Buddy, is a treat-based puzzle toy line that is ideal for canines of all ages but has become a particular favorite of parents to senior dogs (on account of how tasty treats can serve as extra motivation to stay active). Aikiou. These interactive puzzle-based dog feeders have put Aikiou (the name represents a phonetic spelling of “IQ”) on the map. 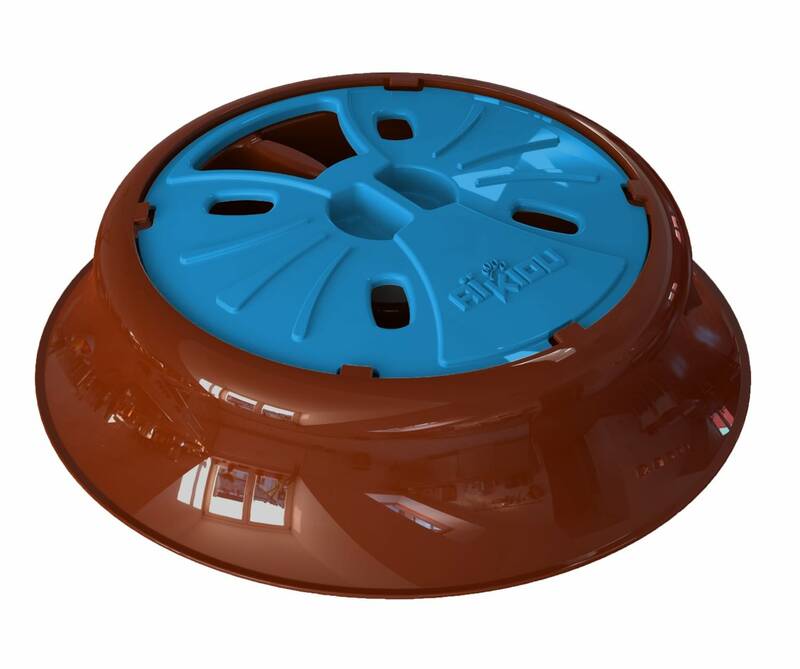 All bowls are designed by leading dog behaviorists to quell anxiety and alleviate boredom. Remember to keep your dog safe! It is so very important to know how to tell which toys are safe! In some cases, what constitutes “safe” may change depending on your pet’s breed, size, chewing habits, and temperament. 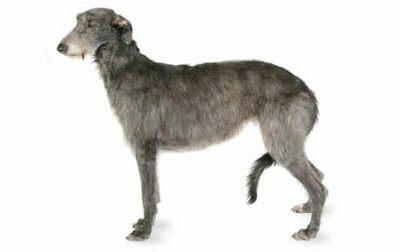 For example, if your dog eats stuffing like you eat potato chips, you know to remove the stuffing first or just steer clear of stuffing-based toys. But in other cases, unsafe = unsafe. For example, be sure to check imported toys to verify dyes and materials are free from potentially toxic chemicals, including lead. If you can’t find the materials information you need to verify toy safety, it is best to steer clear. As well, if your dog has any known health, weight, and/or movement issues, you may want to have a chat with your vet before introducing any new toys, and especially toys that involve treat rewards. 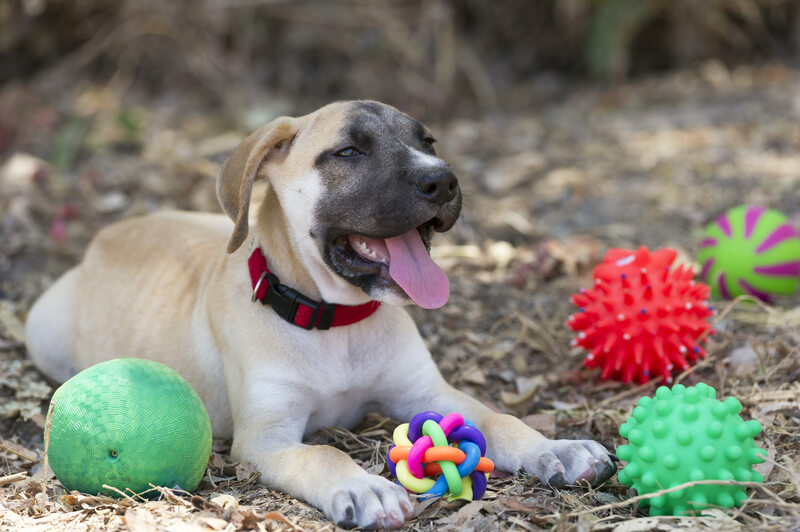 The ideas in this post represent just a handful of the many ways you can enrich your canine companion’s life with toys, games and puzzles. 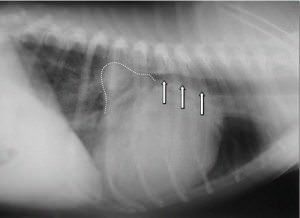 Hopefully, your personal firsthand knowledge of your dog’s habits and preferences will be your best ally to find the DIY and ready-made dog puzzles your canine sidekick will enjoy the most. Good luck and happy toy hunting! PreviousWhy Dog Puzzles Are The Perfect Replacement For Rawhides!